my solution integrated several of the above solutions. change my local windows account password to something that doesn’t have special characters in it. This solved my issue too http://support.kaspersky.com/us/12092#block1 is where to look for this. The feature “SMB/CIFS File Sharing Support” is required also, please add this to the document! I get a mount error(115): Operation in progress. Pinging 10.0.75.1 results in 100% package loss, traceroute fails. Pinging the Linux VM from Windows works just fine. I have deactivated the Windows FW on the host for the 10.0.75.1 interface, but no improvement. Browsing \\10.0.75.1\C from the host works fine, so the share is active and accessible. I then checked the routing table in the Linux VM and found that there are 2 default GWs configured (10.0.75.1 and 192.168.65.1), which normally is not a good thing and could explain the failing ping and traceroute. I also found that the system time was way off (22h in the past). Even if everything else would have been ok, Windows would have treated all requests as replay attack and thus rejected them. I manually corrected it, but it might make sense to leverage NTP to ensure proper system time. I’ve been also struggling with this problem for a while and I’ve found a working a solution (at least for me). I have a corporate machine, Windows 10 Enterprise, inside an Active Directory (my account is an AD account). I also created a local admin account to test. So it’s kind of obvious that the problem is somewhere between the mobylinux and the host windows10. I wanted to try to mount the C drive directly from mobylinux I couldn’t do that so I created a another VM (it was an Ubuntu) on the same network (DockerNAT) and started to play. I just tried to mount the C drive of the host Windows and list it. Unfortunately there is no way to define explicitly the domain with the Docker for Windows so finally I entered my AD username without password and it started to work! So I guess it could be fixed making the configuration more flexible. 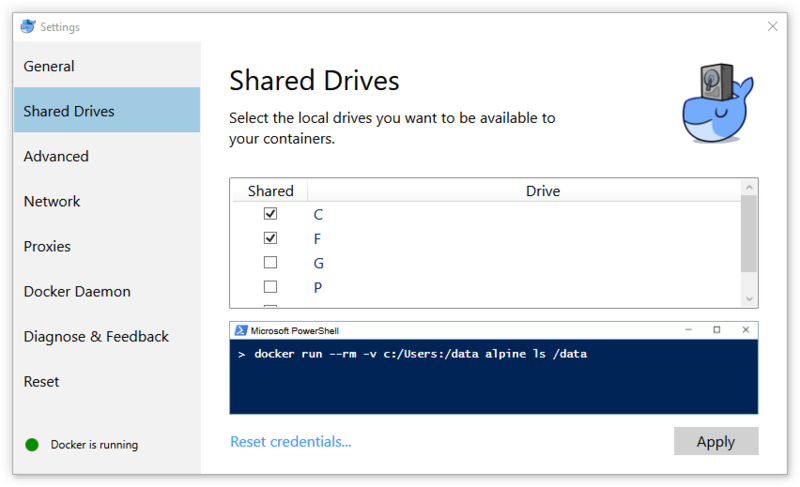 Docker tray > Settings > Shared drives > Tick the drive on which the folder is located. Changing unidentified networks to private fixed it for me. Is there a way to only apply this to the Docker network? # (host running on HyperV) so that it is visible to Docker containers. # It enters the moby VM using nsenter via an ubuntu container. I run it in Windows using Cygwin. thanks for that conversion. unfortunately back to volumes not working on windows with very little idea why, I get 115 operation pending error when I manually try the mount. I am on the pre-release windows program and it is a bit of a crap shoot when a new windows build comes along whether docker mounts will work. When I follow this approach I can get host folder mounted properly and sharing seems to work. However, I have no clue what do I supposed to do next. This workaround seems to be temporary and sharing drops as soon as I quit the container. This PS script throws mount error(112): Host is down. But it’s certainly up. Played with shared folders through Kitematic, the sharing didn’t work either. Any ideas guys what I could have missed? Will appreciate any help, nearly give up trying. However I am unable to mount a windows volume from a docker file or a docker compose yml file when trying to build a image. What I am trying to do is to build dotnet core applications from a container rather than build that application on the host and copying the binaries into the container that runs. After following this thread for a few weeks now and trying (almost) everything, I finally got it working.